These are a prepaid pack of online speaking fluency classes. You can choose from a Pack of 5, 10 or 20 class. 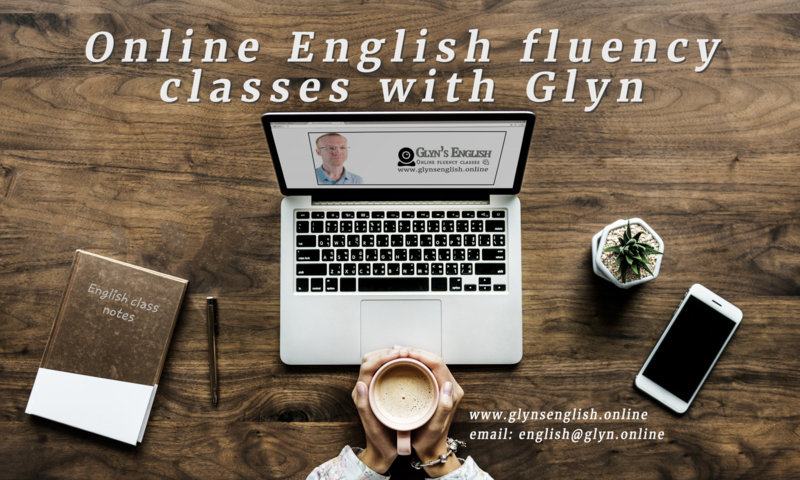 By purchasing one of these packs you will receive a discount of up to 20% on the price of our online speaking fluency classes as well as faster and simpler class scheduling. Not only do you get a discount on each class but scheduling those classes is simpler and faster too. Rather than making individual payments for each class, you can now make one easy payment. You will then be sent 5, 10 or 20 single use weblinks to use for our booking system. These special links give you access to our online booking system but without having to enter your payment details each time. After purchasing this pack, you will first receive an initial email with your receipt. Then, shortly after, you will receive a second email from me delivering your booking links. You can then use each of these links to access our booking system and to choose the time and date of your class. What are the benefits of using these packs? Firstly you get up to 20% discount on the price of your classes. 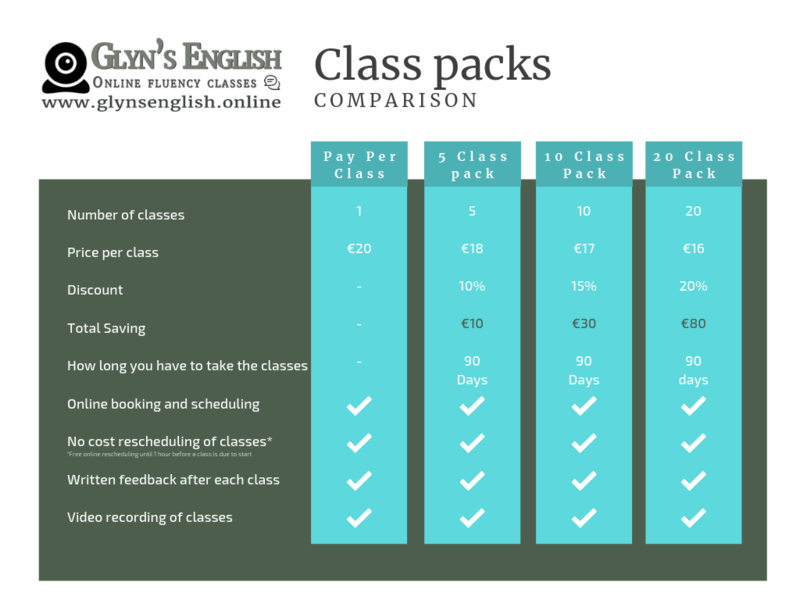 If you buy the 20 class pack that is €16 a class compared to the standard €20. Secondly, when you book your classes with the links in the packs, it’s much faster and easier as you won’t have to enter your payment details every time. Just click on the web link, choose your day and time and then finally click confirm. Done! Easy, secure and instant booking. Do I have to schedule all the classes when I buy the pack? You have 90 days to individually book each of the classes, If you want to confirm the dates and times for more than one class at the same time, no problem you can. Or plan and arrange your classes week-by-week, booking them individually. Each link that you will receive allows you to view the calendar as many times as you want. However, the links are ‘single use’. This means that once you have used a link to confirm a class booking, that link will stop working. What happens if my plans change after booking a class? If your plans change, don’t panic! Just like individual class bookings, You can reschedule your class up until one hour before it is due to start without any cost or penalty. How long do I have to book the classes? Does the pack expire? The packs and their web links are valid for 90 days. After this period, the links and their credit will automatically expire. A prepaid pack of 5 online speaking fluency classes with a 10% discount. A prepaid pack of 10 online speaking fluency classes with a 15% discount. A prepaid pack of 20 online speaking fluency classes with a 20% discount.